 UK  2012  101m   Directed by: Dominic Burns.  Starring: Bianca Brigitte VanDamme, Sean Brosnan, Simon Phillips, Maya Grant, Jazz Lintott, Andrew Shim, Peter Barrett, Joey Ansah, Amelia Linney, Raji James, Sean Pertwee, Julian Glover, Jean-Claude Van Damme.  Music by: Si Begg. 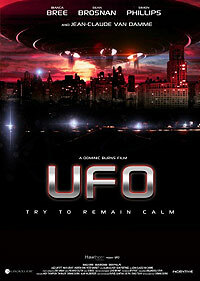 The overview of British independent cinema continues with UFO, which if the budget is to be believed, kind of falls outside what I would normally consider to be independent in the manner of all things being reviewed. At $2.5m (£1.75m) this is a feature that, financially at least, had all the backing it needed to be at least in the same ballpark of achievement, albeit a different genre, as the UK indie classic "Dog Soldiers". Sadly money alone is never enough, and from the outset it was clear that too much of that $2.5m found its way into the pockets of cast and above-the-line crew. There just wasn't enough of that substantial budget on the screen in qualitative terms. Sure there were CGI moments that, whilst not in the same league as Avatar, Star Wars, Battlestar Galactica, or even Buck Rogers, tried hard to be credible. But what cannot be overcome in an independent film at any budget level is a woeful script that fails to ignite its actors, instead merely squelching onto the screen damp squibs of woeful acting on the part of the characterless and unimaginative cast. From early doors, in fact the first 30 minutes, we were introduced to a one dimensional set of characters without a redeeming or interesting quality amongst them, rambling on about everything and nothing in an attempt to illicit some degree of connection from the audience. All they served to do however is aggravate and annoy to the point one longs for the appearance of the USS Enterprise to commit 'hari kiri' with a photon torpedoe attack as the only way to deal with a human race that's just not worth saving. There was but one decent performance amongst this sad lot - Maya Grant (Dana) - the most surprising thing being her complete lack of experience and this being, apparently, her feature debut. She held it together, for the entire movie, from being just a total mess. Brosnan was okay I guess, Bree very wooden, Philips just plain unengaging like so many of the films he's been in. He really should give up in front of the screen. Van Damme was wasted but seems to be whoring himself out lately. Glover too is better than this film. But to me the biggest disappointment was Pertwee - not so much in his acting because I really rate him as an actor - but in how little screen time he got. Not his fault, but I wish he would be more discerning about the projects he chooses and do something that fits the level of amazing talent he has. What basically filled the void of 90 minutes whilst watching this movie was a lot of talking heads, exposition, mesmerized gazing into the distance, and lots of 'we've got to get out of here's'. What little action there was came too infrequently and was so detached from what little plot there was that it seemed episodic and completely out of sync. Neither did the narrative seem to know what it wanted to be - thrilling action-led sci-fi or sci-fi comedy. Tonally it was all over the show and delivered neither convincingly. Clearly whatever the point of the story was it was completely lost in translation or never even made the screenwriters page TO be translated in the first place. More development in the pre-production stage and script editing was obviously needed. It's not a thing I would ordinarily say but I feel bad for the investors in this instance, because I just can't see how in a month of any given Sundays this movie will get close to repaying the dollar value put into it. I expected so much more than the filmmakers delivered if for no other reason than the Brits have been spoilt in years gone by, by talented filmmakers delivering so much better on the same level of money or less. Part of me thinks that Dominic Burns, the writerdirector of Alien Uprising (or is it UFO here - I've heard both titles used) to use a frequently applied analogy was 'writing cheques his body couldn't cash' - or should I say 'his talent' couldn't. He's bitten off a genre that needed imagination and 'outside the box' thinking on the money available, but delivered instead a wishy-washy, hum-drum, ho-hum, holy mother of Christ do I know what I am movie that merely serves to annoy patrons like me who have parted with their oh-so-hard-earned green and been treated to a slap across the filmic chops! Oh well, onwards I guess - hopefully to a Brit indie flick with more to say and more to enthral with. Review by David Starr from the Internet Movie Database.